Checking the supply voltage at a VAV controller with a 233 Fluke 233 Remote True RMS Display Multimeter. In my role as a consultant and trainer, I spend a lot of time working with facility maintenance personnel. Recently I was recently given a formidable task by the maintenance leadership of the plant services shop of a large university. 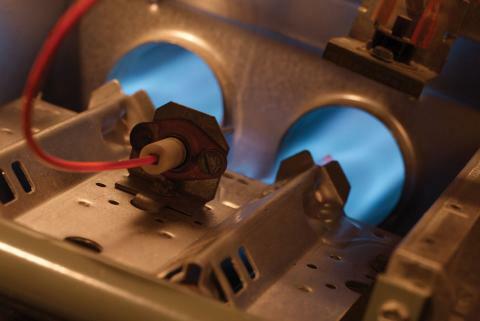 The issue was the inability of the HVAC shop personnel to perform basic troubleshooting of their mechanical systems. The most common HVAC system on campus is variable air volume (VAV). These systems are literally all over campus and they number in the hundreds. 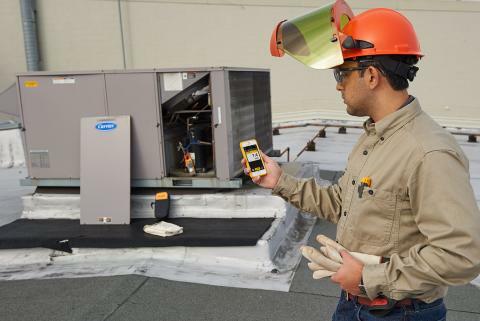 Accurate, fast troubleshooting is vital to minimize occupant complaints and to save energy. When I was given the task of coming up with a staff performance solution, a number of restrictions were given to me. A typical solution for this type of problem would be to purchase laptop computers with the appropriate software for the VAV systems. The management felt that this would not be a good solution due to the purchasing expense and need for continuous maintenance of the laptops. In addition, since multiple vendor control systems were being used, vendor software (of various revision levels) would need to be loaded on the laptops. Cables and adapters for each manufacturer would be needed as well. To complicate matters further, different vendors support different operating system platforms. Even with these restrictions it was determined that the team members would have access to the "front end" monitoring computer in each campus zone. Basic VAV system set points, parameters, alarms, and trend information was available. Some of the VAV systems still utilized pneumatic controls that were over 20 years old! The desire was to purchase high quality test instruments for use in each zone. 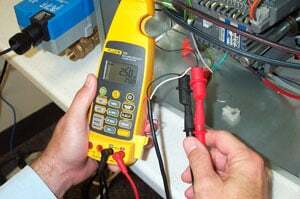 Checking the signal to a VAV box actuator with a Fluke 773 Milliamp Process Clamp Meter. Many expressed that they did not thoroughly understand the operation and control sequences of the VAV air handling units and VAV terminal boxes. Airflow: VAV Terminal BVox airflow measuring, using a handheld device. Temperature: An instrument that would measure the temperature in the ducts and rooms. Humidity: Accurate humidity sensing both in the VAV air handling system and in the VAV terminal units. Static and velocity pressure sensors: A micromanometer could measure small pressures from the static and velocity pressure sensors used in the building control systems. This would allow the system sensors to be checked and calibrated on a regular basis. Indoor air quality (IAQ) parameters: These included carbon dioxide, carbon monoxide, and outdoor air percentage measurements at the air handling unit, calculated using either temperature or carbon dioxide as desired. 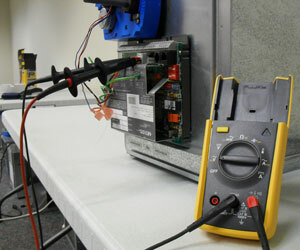 Voltage, current, and resistance: Measurements to check the actual signals coming from the sensors. The effort was spread across several different shops with different goals. Sometimes the goals were in conflict. 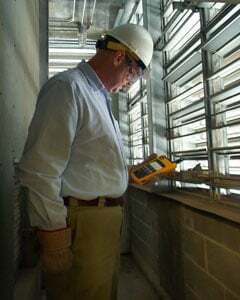 Checking the entering air temperature at a VAV air handling unit with a Fluke 975 AirMeter™. A customized training class focusing on VAV system operation and troubleshooting, for two different groups of team members; performed in two sessions so that only half of the staff would be unavailable at any given time. The training would consist of using the actual control diagrams and sequences of the VAV equipment. Hands-on time would consist of practice on the building equipment in each zone. It was also recommended that the goals of the different groups of employees be coordinated so that they could work together more efficiently. After approval by my management, in 2011 the training classes were performed. After the classes were over, evaluation was performed - not just of whether the students found the class useful, but also if they could now perform troubleshooting more quickly and consistently. At the same time the test instruments were purchased and utilized. Now, three months later, management reports that the ability of the staff to troubleshoot their VAV systems has increased markedly. This was measured by recording the time it took to resolve per complaint.